According to Kurdish Bas News Agency, the US transferred about 50 tons of gold from areas seized from ISIS in Deir Ezzor province. The report says that the gold was withdrawn from Syria through the US military base in Ayn al-Arab. A part of it was allegedly shared with the Kurdish People’s Protection Units (YPG), which are the core of the US-backed Syrian Democratic Forces (SDF). Separately, the Syrian state-run SANA news agency claimed that US forces relocated large boxes containing ISIS gold treasure from al-Dashisheh region in southern Hasakah. The UK-based Syrian Observatory of Human Rights (SOHR) claimed that ISIS members in the Euphrates poses about 40 tons of gold, which is being used to buy a safe passage from the area besieged by US-backed forces. 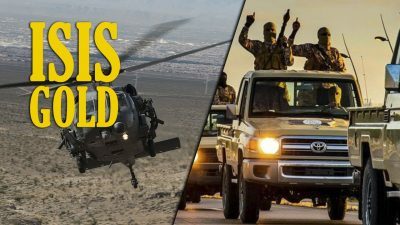 The SOHR claimed that the SDF and the US-led coalition “deliberately” do not attack the ISIS-held area in order to force ISIS to surrender its treasure. On February 28, the SDF acknowledged that ISIS had released 24 SDF members, whom were captured by the terrorist group in the previous battles. The US-backed force also confirmed that it had paused its anti-ISIS operation claiming that this is done in order to avoid civilian casualties. At the same time, according to reports, over 350 ISIS members surrendered to the SDF during the last few days. Russia and Israel are considering to set up a working group with several other countries to address the issue of removing all foreign forces from Syria. First reports in this issue appeared on February 26, following a meeting between Russian President Vladimir Putin and Israeli Prime Minister Benjamin Netanyahu in Moscow. Netanyahu said that the meeting with Putin was “good and productive” and revealed that he had shared intelligence information on Iranian deployment in Syria with him. The Israeli PM went on to say that Russia is also interested in removing all foreign powers from the war-torn country. On February 28, Putin confirmed that the sides had discussed such an idea, which should allow to withdraw foreign forces and to normalize life in the war-torn country. However, so far, no details have been provided, which would allow suggesting how this kind of group could work. While Moscow and Tel Aviv have some level of understanding regarding the situation in Syria, there are little doubts that they may have a different understanding of the “foreign forces withdrawal” concept. Meanwhile, the situation in the Idlib de-escalation zone is not improving. Reports about ceasefire violations appear in northern Lattakia, northern Hama and western Aleppo almost on a daily basis. This comes amid resumption of Syrian and reportedly Russian airstrikes on terrorist targets in some parts of the zone. According to local sources, just recently, Syrian and Russian warplanes hit several positions of Hayat Tahrir al-Sham in southern Idlib.